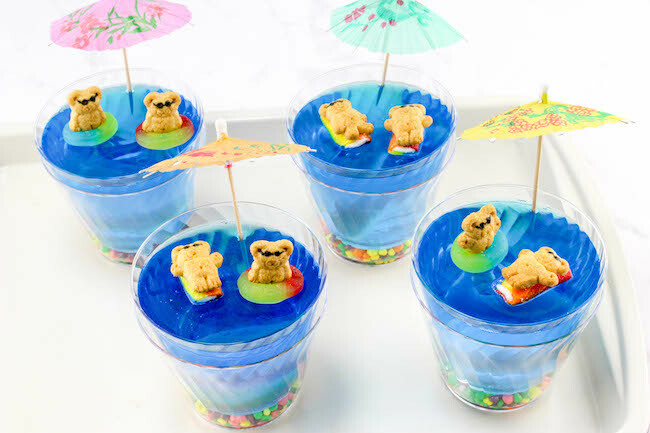 Blue Jello Cup Recipe: A Pool of Teddy Bear Fun In The Sun! Jello Cups – Summer Day Fun For Everyone! 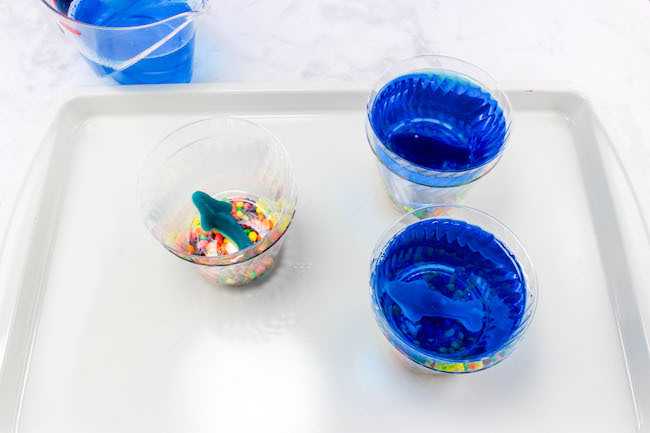 Since we are on a roll with cute mini desserts, I thought we’d sneak in a fun summer dessert that the kids will absolutely adore…Blue Pool Jello Cups. It’s a recipe that’s easy so you aren’t slaving over a hot stove while everyone else is enjoying themselves outside. And besides, who doesn’t love jello especially with teddy bears floating around in the pool. 1. Prepare Jell-O according to package directions. 2. Pour about 3-4 tablespoons of nerds into 5 plastic cups. 3. 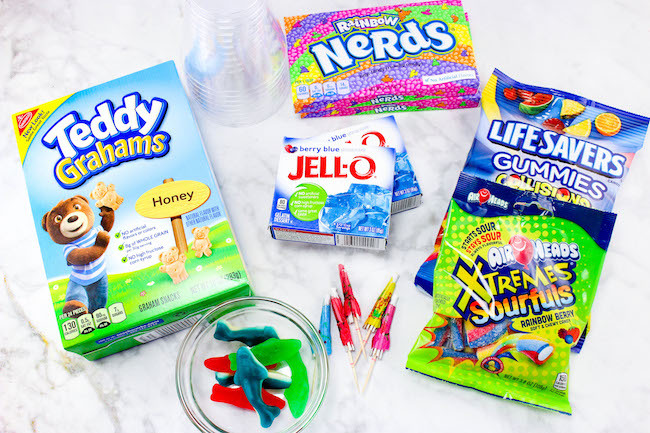 Place an empty cup into each of the cups with nerds, and place a gummy fish down in each cup if you would like. This is a great option that kids will love. Seeing little fish in a sea of jello will bring big smiles! 4. Pour Jell-O into each of the 5 cups, and fill within 1/2 inch from the top. 5. Refrigerate for 3 hours or until gelatin is set. 6. Use the Lifesavers and Airheads as floats to put on top of your blue gelatin water, and put the Teddy Grahams on the floats. (Make sure to put the teddy graham inside the lifesaver before you place it on the jello). 7. Place an umbrella into each cup as well. 8. The nerds resemble rocks in the ocean while under the blue gelatin cups, but they can be added to the Jell-O to eat or just by themselves. Just remove the cup with the jello in it and enjoy. 9. Fun for summer parties! The recipe above is geared more towards a pool inspired look – well except for the fish of course, most of us do not have fish in our pool! 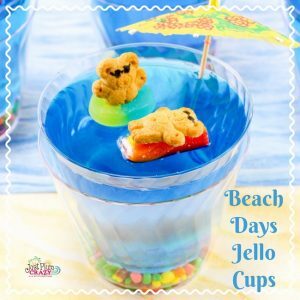 But if you are looking to create something for a more beach inspired event – then a Jello Beach Cup may be a better fit. The recipe from above will stay the same – only difference is that instead of the rainbow nerds at the bottom of the cup – you can use pieces of toffee, or my favorite crumbled graham crackers (or teddy bears). By replacing the colorful nerds with a beige toned accent it will give a more beach feel with your jello dessert! 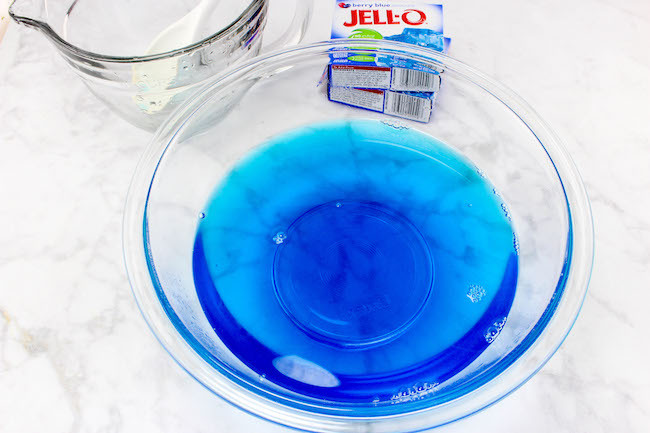 Be creative with your design, the customizations to this jello recipe are limitless! Pour about 3-4 tablespoons of nerds into 5 plastic cups. 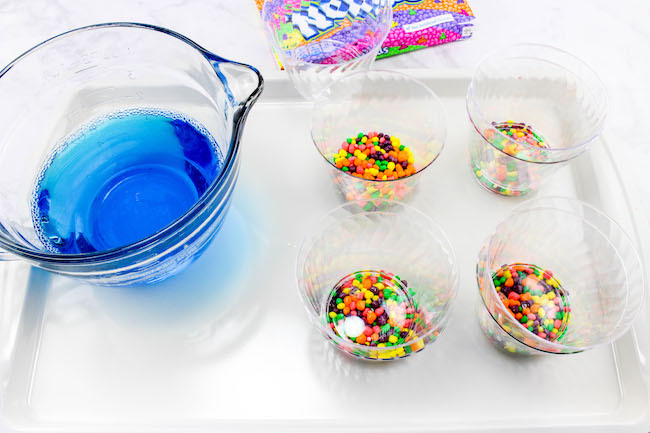 Place an empty cup into each of the cups with nerds, and place a gummy fish down in each cup if you would like. Pour Jell-O into each of the 5 cups, and fill within 1/2 inch from the top. Refrigerate for 3 hours or until gelatin is set. 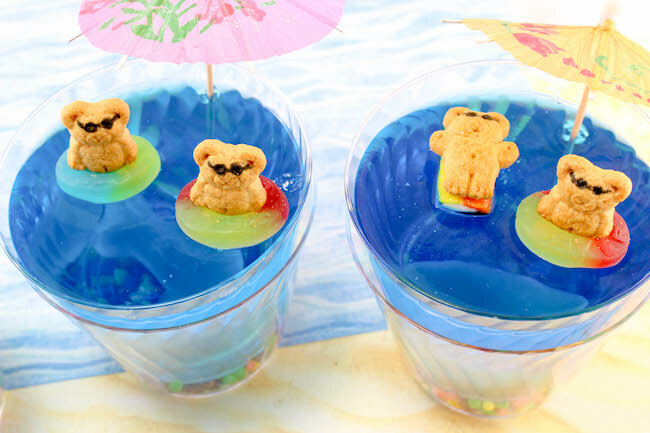 Use the Lifesavers and Airheads as floats to put on top of your blue gelatin water, and put the Teddy Grahams on the floats. (Make sure to put the teddy graham inside the lifesaver before you place it on the jello). Place an umbrella into each cup as well. The nerds resemble rocks in the ocean while under the blue gelatin cups, but they can be added to the Jell-O to eat or just by themselves.